The panel contained three speakers: Angela Galvan, Digital Resources and Systems Librarian at SUNY Geneseo; Eileen Clancy, Beyond Citation; and, Nat Gustafson-Sundell, Collections Librarian at Minnesota State University, Mankato. 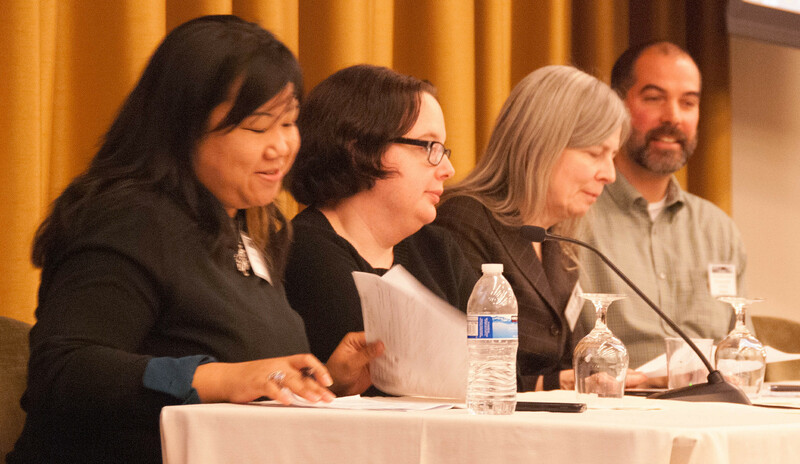 Each speaker took a different tack on how relations with vendors impact or influence academic libraries’ practices, holdings, and acquisition decisions. The speaker contended that vendors, by means of software developed by third parties with competing agendas, influence academic library environments through the systematic relocation of core values. These values inform decisions about library systems, a mechanism that connects users with the collection. She noted the power differential between large and consolidating vendors forming the basis for the library-vendor relationship, which has led to extensive control of institutional data and ability to influence academic libraries innovation and definition of users’ needs. Problems resulting from the use of such externally developed software include: the appropriation of libraries’ dataset information, citing examples of vendor-supplied software designs that compromise user privacy: how records can be kept of which ebooks patrons have read, which particular pages they have focused on, and who requested a given acquisition. In order to work toward reclaiming agency, the speaker recommended that libraries: get rid of vestigial workflows; be prepared to say “no” to vendors; not reward poor execution with money or free labor; ask for better contracts; work against silos; pay their interns ; and advocate for maintenance and documentation. She concluded that, when we relinquish control over the software we provide, we effectively relinquish control over our values. In the context of access restrictions suffered by the un-affiliated scholarly materials in the United States, the Eileen Clancy discussed how decisions made beyond the academy have shaped and affected academic collections and data access. From the Farmington Plan, in which ARL libraries sought to acquire one copy of every book published, to how an offshoot of the Food for Peace program funded the acquisition of Area Studies programs material during the Cold War—through the use of the Public Law 480 Library Program, which allowed twenty major research libraries to build collections that focused on such countries as India, Pakistan, the UAE, Nepal, Burma, and Indonesia; arguments in favor of national security provided another funding stream. In contrast, the Early English Books Online (EEBO) database, which contains over 100,000 early English book titles (1475-1640) is owned by ProQuest, who declined to renew it! This and other databases are also described. Clancy noted that some access is available at beyondcitation.org, due to the efforts of students, librarians, and scholars who wanted to provide digital access to humanities resources. Clancy also discussed how access to resources depends on affiliations—at least, in this country—and recommended accessing the Digital Library of the Unaffiliated for a discussion and workarounds, as well as Sci-Hub, which has collected over 50 million papers. Going forward, she opined that scholarly societies, library associations, funders and the government need to step up in order to make access to such resources available. Gustafson-Sundell noted that, in the case of a license signed by a consortium on behalf of his own institution, the consortial agreement actually violated state law. He also provided data demonstrating that he was able to obtain better deals across the board when dealing directly. While noting that consortial deals might not always be worse than direct deals, and that he (and we all) are working from limited data, he stressed the need for agency in collection development. In choosing an ILS, Gustafson-Sundell warned that consortial deals could prevent individual libraries from accomplishing their own priorities. He warned against the prevailing consortial practice of depending on scoring frameworks that tend to reward systems with the most features—whether or not those features work well or will be used by a given library. Individual libraries can establish scoring frameworks that are more rational for their own purposes. Overall, he questioned the business case for technology consortia, noting that libraries no longer need a central office to house servers. Characterizing the technology consortium as a ‘zombie organization’, he warned that technology consortia might seek to cannibalize the functions of other consortia (such as collection development consortia) or of libraries themselves, in order to develop new business cases for themselves. In sum, Gustafson-Sundell maintained that individual libraries are often better off dealing directly with vendors, rather than working through consortia . He questioned the prevailing mythology about consortial cost-effectiveness, showing that institutional agency is a key to getting value from library deals. Trish Keogh is the Cataloger/Metadata Librarian at LIU Brooklyn. She has been a member of ACRL/NY since 2007 and has serves on the Symposium Planning Committee .